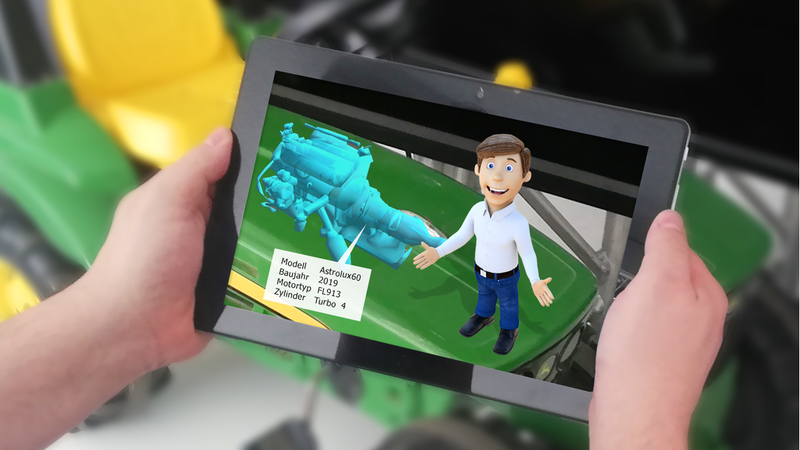 Using the example of a John Deere tractor model we show how easy an Augmented Reality (AR) Support Assistant can help to learn functions. 3D assistance via avatar, visualization and effects are integrated in a browser-based AR environment. After scanning an area with the smartphone camera, a 3D avatar explains audio-visually the functionality of the tractor supported by additional 3D visualization. The example can be adapted to complex machine systems or operating elements. Additional equipment such as VR glasses is not required. The AR-Support Assistant is cloud-based, runs in the browser and can be used directly on smartphones or tablets without additional software. Interaction up to chats or questions can be supplemented by connected AI-Assistant. Used in the area of sales promotion the AR-Support Assistant is able to interactively transmit necessary additional information on products.